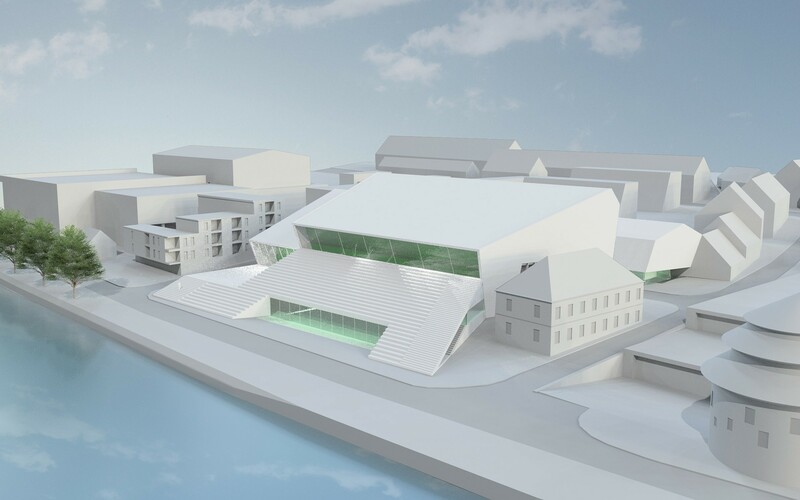 It is the stated goal of the City of Maribor that the river Drava itself should become the main event space of the city. Traditionally, the riverbank is the place where people go for a leisurely stroll, meet friends and acquaintances, dress up (or down) and maybe flirt a bit at night. 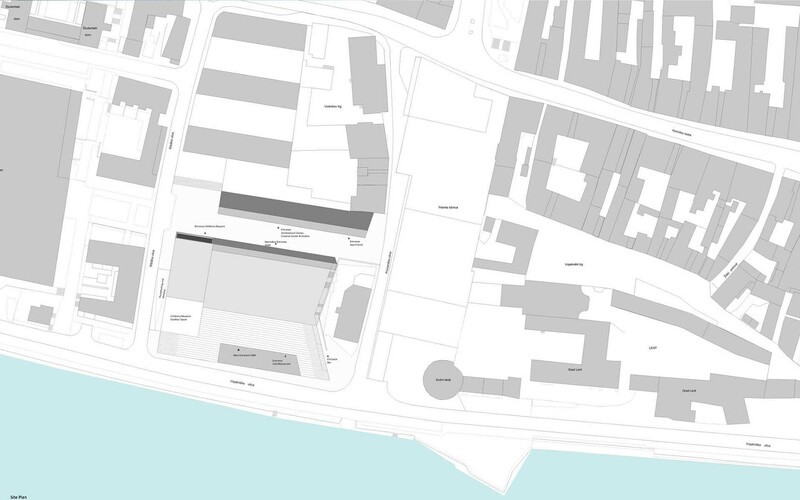 Our proposal puts the Drava River literally center stage. 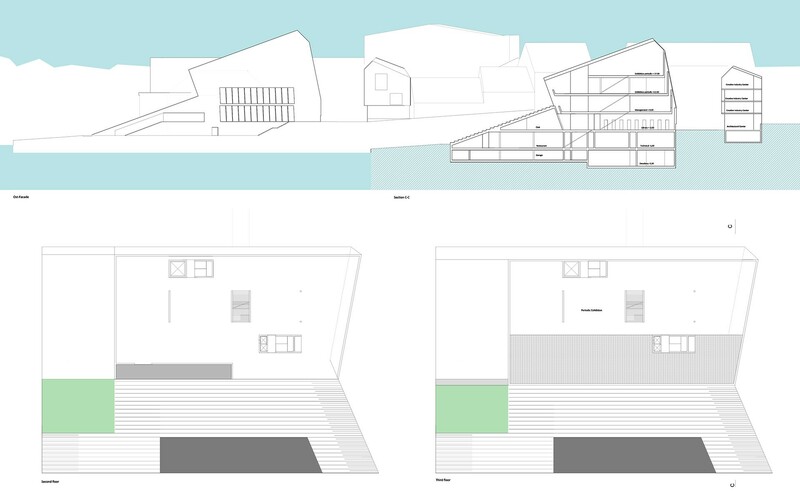 The new Maribor Art Gallery (Umetnostna galerija Maribor - UGM) offers a public space, a large stand for the new event space: large stairs following the slope of the river bank, offering dramatic views of the river. 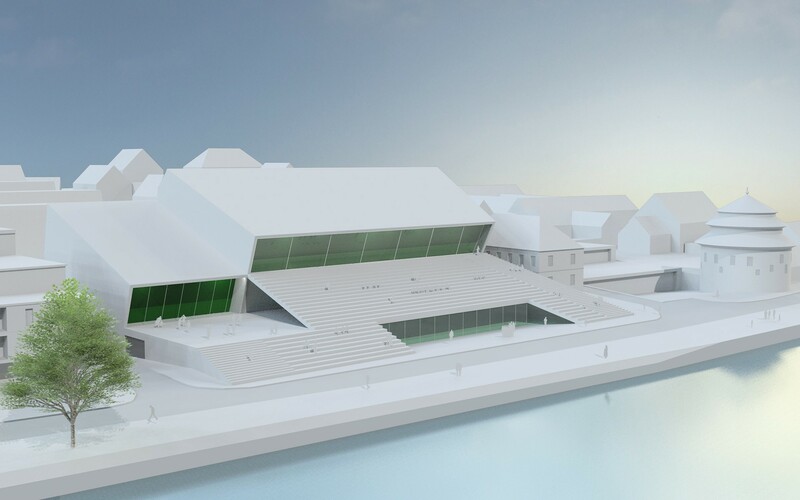 The people of Maribor will be able to sit and enjoy the view, the sunset and the events taking place on the river and the riverbanks. 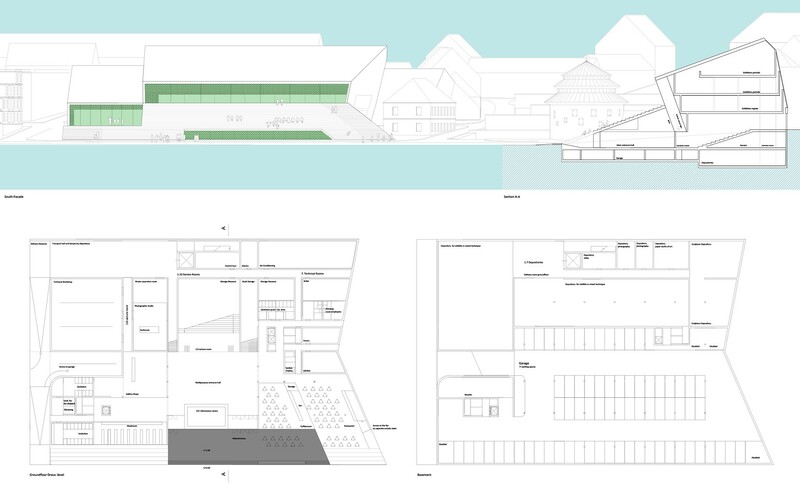 This public space is to become the central meeting place for the community of Maribor, informally or otherwise, a place to talk, chat and converse, supplementing the cultural offerings inside the UGM building. The UGM building itself consists of two volumes, one big and one small, both with slanted roofs. They intend to be part the quintessential image of the city of Maribor, the beautiful roofscape made up of countless thatched roofs. Inside the UGM all programs are provided with direct and indirect daylight in several different ways, depending on the particular requirements of the spaces and programs. The entrance to the main hall is kept low at the beginning of the sloping stairs. As soon as you enter the main space of the central hall rises up to its full height. Here, indirect daylight is provided from the highest point of the hall. 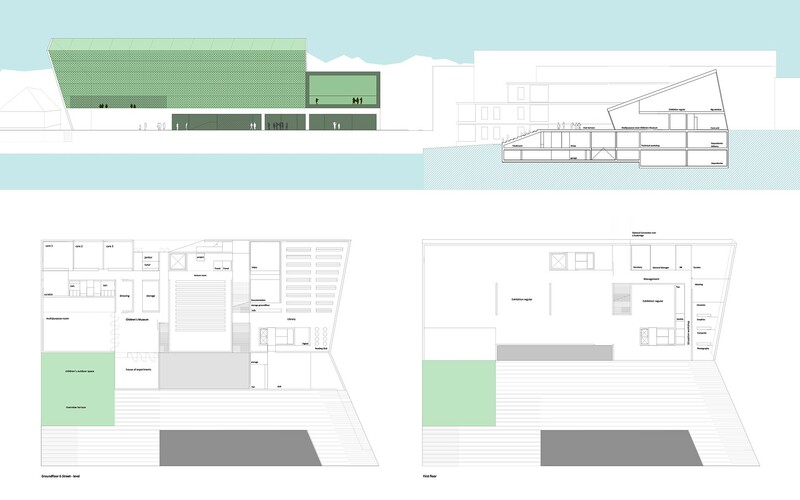 All exhibition spaces have indirect lighting from the north facade. The south facade functions as a climate buffer. This facade also offers carefully staged views of the Drava and the city of Maribor. The central hall is the central distribution point of the building. All functions and programs are accessible from here, although the secondary programs all also have their separate entrances, allowing independent operation. The floor of the main hall follows the slope of the riverbank. On the north side part of the main hall can be separated with sliding walls to become the auditorium. The main hall is also accessible from the north side of the building, from E-Street. Opposite, in the building on the north side of E-street, the Creative Industry Center and the Architecture Center, as well as the studios and apartments, are located. The space between the two buildings connects the UGM to the market and, by extension, directly to the old center.